This time the magic and the story are all about Christmas. The characters in the story decide it's time to give Santa Claus a Christmas present, but what? At the end of the story, which we won't give away here, the Magic Storybook is opened one last time to reveal a large Christmas Tree. Then it is formed into a cone and presents are produced for all of the kids who helped to tell the story. Effect: As with all my Magic Storybook effects, the main attraction is a book filled with blank pages. When character cards are randomly chosen by members of the audience, the characters appear on a new page as the story unfolds page by page until the story ends. Whats new to my Christmas Storybook is the way the characters (and the story line) are chosen. 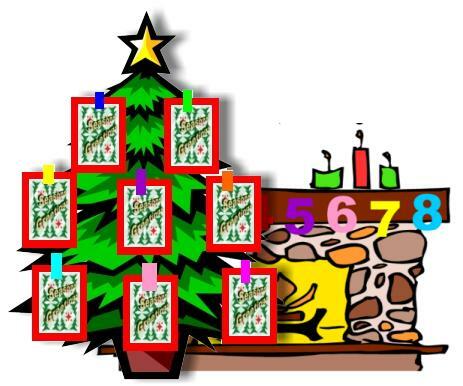 Christmas Cards containing pictures of the characters are removed from a card holder tree (template and instructions for making are included) marked with numbers randomly chosen with the aid of a fireplace holder (template and instructions for making are included). The choices are actually made using a Consecutive Force which will be explained in the e-Book. At the end, the book is rolled up and a stream of wrapped candies (or small toys) pours forth into the hands of your helpers. The book can be given to one of the helpers at the end, or donated to the school library, etc. As with all my Storybook effects, you print out the books and cards with your own computer printer. Photo paper is recommended for some of the printing, but you can also use card stock and even plain paper. You make all the other necessary props yourself following instructions in the e-Book. This e-Book introduces a new concept that I call the Consecutive Force and a new variation based on a combination of old methods for acomplishing the force using the Christmas Cards.